Today is a Special Day! 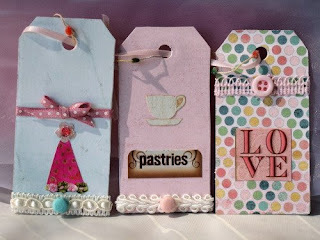 Over at Make Mine Pink, we have a new weekly program titled "Pink Friday". What it actually means is each week, the Boutiques at MMP will feature a well coordinated shopping experience with a theme - an all new approach to Internet Shopping. This week, we bring you “Springtime in Paris”. Indulge your Parisian style as you browse the participating boutiques at Make Mine Pink! Click on the icon to bring you to view all the participating boutiques now! On another hand, I also have some exciting news to share with you. 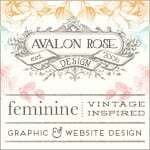 My talented pink sister, Carrie of Noelle Garrett Designs and I merged our talents together to bring you a unique set of product tags. 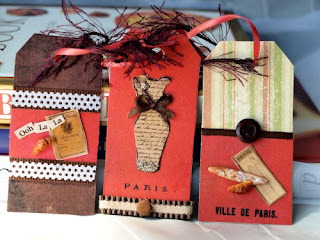 Carrie makes beautiful, one of a kind custom stationary, journals and home accents. 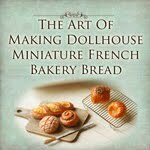 I'm just so thrilled to be able to have my miniatures featured on her beautiful work. 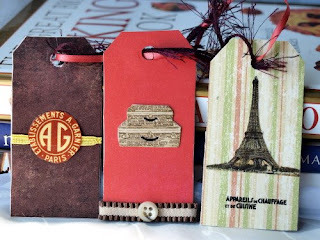 These are the first few set of gift tags we produced. All images are courtesy from Carrie of Noelle Garrett Designs. 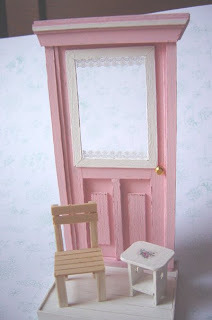 The 1:12 Miniature Pink Door is half completed. I love it... I also love the "transparent glass panel". Of course in 1:12 miniature making, glass would be too heavy to handle, so I made it with polyester sheet. I so love the lacy patterns on the glass panel. It's so me. The best thing about miniature making is that I get to satisfy all my craving which I don't necessary get to in real life. For example, I want a pink door in real life, but it's not a colour that everyone in the family fancies. If I could, in real life, this door is exactly what I would like to have. Earlier I made a rose wreath using reindeer moss, but in the midst of decorating, it looks too "christmasy", so I am in the midst of making another wreath for the door :) I wanted a spring feel. I was also playing around with the chairs. I've not decided whether to use the shabby stool, but I wanted to paint that small chair. I wanted to get some perspective, so I decided to do something fun! I made a poll, to see what colour you think would be nice. At the top right hand corner of my blog, you would see a poll! It's Monday again which means it's Show and Tell! For us at Make Mine Pink, Show and Tell Monday is a day where we share and blog about what we have done in the past week, it could be anything. This piece was also made in Hong Kong. I know it's a tad early for Christmas, LoL but I wanted to learn it in advance for this year. Also, I plan to make a few variations to this. I'm currently obsessed with doors. I brought the piece back home to make further reinforcement work to the cake. What happened was that the clay didn't dry quickly enough for me to slice and decorate, so my teacher told me it would be best to let it dry completely before doing anything. I had a hard time deciding what colour I wanted for this. I was torn between this and pink. 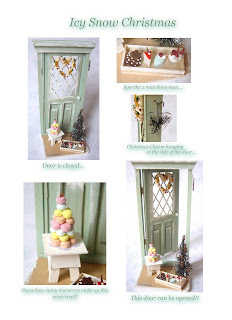 But knowing I would be making another Pink Door, I decided to change this time and opted for a mint green. Now, I also have plans to make a Blue, Turquoise, Purple, Yellow Door. I think the different colours would bring out different feel to the piece. The original design was slightly different from mine. I wanted Macarons, and so I made a Macaron mountain. I so love it! It's colourful and look yummy. I started work on my Pink Door...so hopefully I have something to show soon. 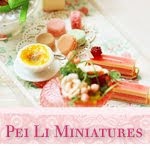 This is one of the piece of craft I made in Hong Kong. It is a Dessert Table filled with pastries goodies. One of the things I loved about this is how I learnt to use hinges. For someone like me who is almost clueless to carpentry work, this is somewhat a miracle. It wasn't easy since the table was small, but I'm glad it turned out well. I like how the table top could be opened to reveal more pastries. Neat! I get to choose from a wide range of colours to paint this...and in the end, I chose a sweet pink (my favourite colour). 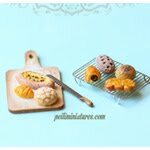 Lots of different types of pastries and tarts. 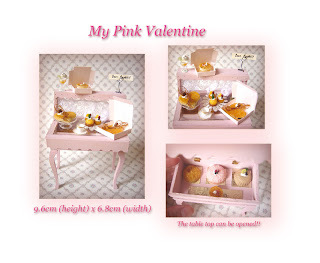 The most time consuming one is the pink colour cake inside the interior of the table. The "veins" of the cake has to be drawn individually. Clay has to be put on top, layer by layer. But I'm happy with the effect, especially after painting. Congratulations! I'll be contacting you to get your postal address! One of the things I enjoy doing on my learning trips is going to one of their popular malls - and there is a food market on the basement in the mall. There are a few unique and exquisite confectionary counters over there and I like to look and study the popular trends of their confectionery pastries and cakes. As you know, I have a fondness for cakes, pastries (even if I don't have a huge appetite!) 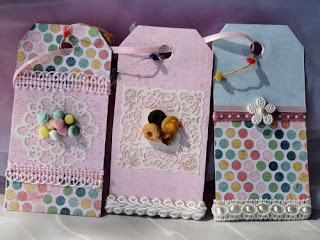 and being an artisan, I like looking at it and thinking of how to make them. I also collect cake brochures, pamphlets as my studying material. On this trip, I realized the difference between what is popular in Singapore versus what is popular in Hong Kong. 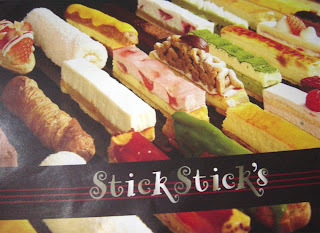 I realized that Stick Cakes is very popular in Hong Kong right now. What is a stick cake? The main difference is in its size. It is longer, but much slimmer, hence it looks much more exquisite than a normal slice of cake. It is certainly popular for ladies who can't resist having a bite of the cake, yet wanting a smaller portion than a normal slice. There is a counter in the basement of the mall that sells solely Stick Cakes. I promise I will take pictures of my work soon...I just haven't due to lack of sunlight by the time I reach home in the evening! On my last trip, I wanted to get something special to giveaway on my blog, as a way of saying thank you to my supportive pink sisters and readers. I made new friends, supporting friends who believed in me. Even though I am still in the midst of setting up a business, I just want to say thank you for all that I have experienced and learnt. Besides, giving is very fun too. I think about how excited the receipient is. The tea leaves come in a nice white box, and the tea leaves are sealed in aluminium foil package. The box can be re-used :) Nothing is wasted! The words on the tin says "Fragrant Jasemine Tea Leaves"
I chanced upon this and thought that it will make a great gift. Jasmine Tea Leaves. I personally love jasmine tea. I usually have a cup in the afternoon. The tea is light, and so fragrant. It lifts you up automatically. I hope you enjoy a cuppa in the middle of the day. Please just leave me a short comment, with your name and email address. I will pick a name on Sunday, and contact the lucky winner via email. I'll get your postal address and send it off to you next week!